The new Volkswagen Jetta doesn’t just have a smart new design: It has a smart new design that complements a host of new standard and available features that can transform a commute and invigorate nearly any drive. Thanks to a 1.3L turbocharged engine the Jetta cruises along with 147 horsepower and 184 pound-feet of torque, but the real spectacle is in its fuel economy, rated at 30 mpg in they city and 40 on the highway. 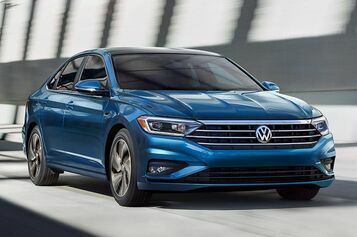 If the standard cut doesn’t fit your tastes, take advantage of the available Cross Differential System XDS® for tighter cornering, Driving Mode Selection for custom driving performance, and 17” alloy wheels that pull together the Jetta’s lithe new look. Safety on the new Jetta is built on a rigid safety cage designed to direct impact force away from passengers. Doing their best to prevent this design from being tested are seven stability-enhancing systems including Electronic Brake-pressure Distribution for steady stopping power while braking and Electronic Stability Control that applies corrective forces to specific wheels as necessary.